Is This The Beginning Of The End For Tallahassee Home Foreclosures? I was updating our monthly report on Tallahassee home foreclosures and found what is likely very good news for the Tallahassee real estate market. 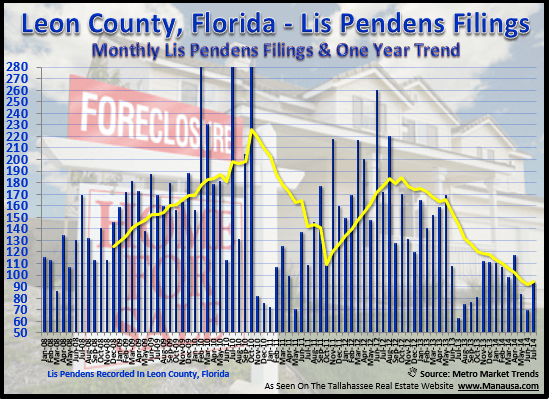 New lis pendens in Tallahassee are on a decline, meaning that the number of people being served foreclosure suits is finally falling. 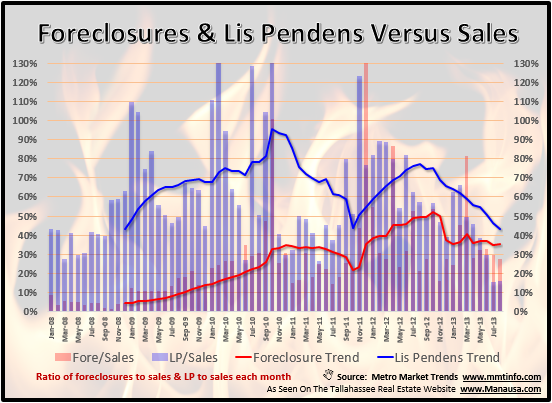 But the percentage of these new filings that result in Tallahassee home foreclosures is on the rise. If you like to keep abreast of recent Tallahassee home foreclosures, we provide weekly, monthly, quarterly, and annual reports at /foreclosures/. Historically foreclosures are such a small percentage of home sales in the Tallahassee real estate market, but that all changed back in 2007. In the Tallahassee home foreclosures graph above, monthly foreclosures are tracked from January 2008 through July 2013 (red bars). The one-year trend (monthly average) is shown as a yellow line, and the current trend is about 110 per month (roughly 10 times the level shown in 2008). To put this into context, home sales in the Tallahassee MLS just exceeded an average of 300 per month, so 110 foreclosures is no small matter. Some of these 110 are counted among the 300 sales, while many are just taken back by the bank and will need to enter the market to be resold. So how is the market actually faring when we look to the future of Tallahassee home foreclosures? The real estate graph below shows new lis pendens filings each month, as well as the one-year trend. The trend is still very (VERY) high at 140 per month. We can expect many more Tallahassee home foreclosures if we are seeing 140 homeowners served a new lis pendens each month. But there is an exciting decline in the trend that accelerated in June, and July posted the fewest new lis pendens filed since before our graph was started in 2008. Could this signal a significant turn for distressed properties in Tallahassee? We have already reported a rise in distressed home values for homes priced between $125,000 and $250,000, and a decline in new lis pendens is only going to strengthen this trend. The key will continue to rest on demand (how many buyers are in the market) and on the rate at which banks release inventory into the market. If you would like to know more about how to purchase the best Tallahassee home foreclosures before the market returns to normal levels, just drop me a note and we can schedule a time to review your needs, wants, and requirements.